Tell me if this sounds familiar: new technology arises, disrupts the system, causes friction, and ultimately revolutionizes the industry. That's certainly a description that applies to the history of the barcode, otherwise known as the Universal Product Code (UPC). 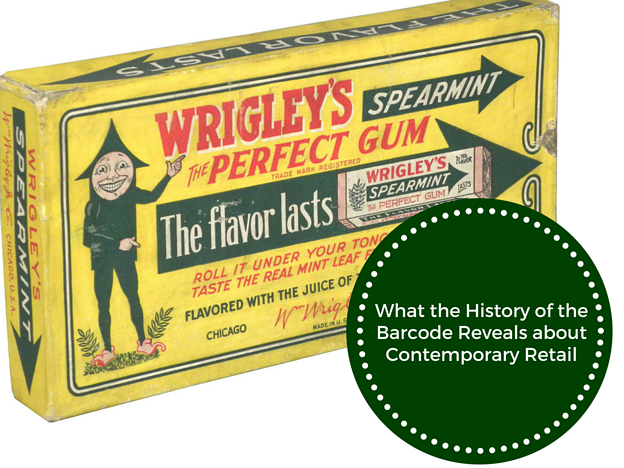 The first UPC ever scanned was on a pack of Wrigley's gum in June of 1974 after a group of grocery industry trade associations formed the Uniform Grocery Product Code Council. The UPC wasn't a very popular development within the industry at first. In fact, Business Week wrote an article entitled "The Supermarket Scanner That Failed" in 1976, two years after the first pack of Wrigley's was scanned. It's easy to see why retailers and manufacturers alike were resistant; retailers weren't thrilled with the high price of expensive scanners, and manufacturers were equally hesitant to spend their time putting tiny coded stickers and each and every item in their inventory. So what happened in between then and now to cause the entire modern retail industry - not to mention nearly every other industry - to become UPC enthusiasts? Well, turns out once the pesky system was implemented, retailers saw a 10%-12% permanent rise in profit, as well as a 1%-2% decrease in operational costs allowing retailers to lower their prices and increase market share. There were also major merchandising benefits from being able to closely track product inventory, which led to superior buying strategies and a greater responsiveness to consumer needs. The real significance of the barcode, however, goes far beyond the individual retailers who benefited financially; the UPC was the first move towards the globalization of retail. Creating and enforcing a Universal Product Code enabled retailers and suppliers around the world to speak a common language that lived outside the normal confines of their daily life. So how does the story of the barcode relate to the retail industry today? As more retailers and brands within the retail supply chain embrace the idea of omnichannel commerce there is an opportunity to replicate the benefits of a universal product code through the standardization of product information. Retail initiatives like Kroger's Project Mercury, Walmart's work with the SCC, and GS1's extended attribute guideline all support the idea that standardization will allow the retail industry to ascend to the next level of global omnichannel commerce. E-commerce has grown fast and furiously, which means there are very few industry-wide requirements. This has negative effects on multiple facets of the retail supply chain and the consumer shopping experience. For suppliers, a lack of standardized product information requirements means that nearly every retailer requests different information, which in turns requires constantly updating and editing item onboarding spreadsheets which can be frustrating and redundant. Imagine how much time could be saved by working under a single set of product information guidelines that's applicable to all retailers, worldwide? A single item setup sheet, a single set of product attributes, a single update for catalog additions and edits. Sounds pretty magical doesn't it, especially for those people whose job revolves around the creation, management, and exchange of this product information. Improving the supplier/retailer relationship and minimizing the pain of item onboarding aren't the only benefits of standardizing product information. It will also create a superior shopping experience for consumers by ensuring that they have enough information to feel confident purchasing a product sight unseen and that the product they buy lives up to their expectations. Standardizing product information will require an upfront investment of time and money. These initiatives will require suppliers to submit a much higher volume of product information than they've ever had to do before, and put more work into creating these assets or collecting them from manufacturers. However, like the barcode, in the long run these changes will streamline internal operations, improve supplier-retailer relationships, and allow consumers to shop from multiple channels with confidence, effectively improving nearly every facet of the retail supply chain.